Butch was a rather accomplished performer who seemed quite conscious of his talents in entertaining visitors with a variety of tricks. Growing tired over two year's confinement, he escaped in October, 1940, and made his way leisurely down the Florida coast towards Key West. Near Oak Hill he overtook a fishing boat. To the astonishment of the crew, he climbed aboard and before their very eyes devoured a whole mess of freshly caught mullet. This made him groggy. Easily lassoed, he was taken ashore. Here he found himself the center of attention and gave his identity away by doing some of his old tricks. Soon he was again back in his bayou pool at Marineland dreaming, the aquarist fancied, of his recent attempt to go south for the winter. Five months later he escaped again. Nine days after his disappearance, news reached Marineland that he was in Miami, three hundred miles away. Incredible as it may seem, he had swum the whole Florida coast, via the Inland Waterway-this explaining alarmed reports of an undulating sea monster from various places on his itinerary. He was reported as thriving, having chosen as a home the area on the Miami waterfront where the boats returned every evening with fish that the skippers where generous in sharing them with Butch. The skippers in turn , had learned that Butch, by drawing crowds to the pier to watch him eat fish they had just caught, was the best possible advertising agent for their business. They would have no part in helping capture and return him to the Marine Studios !!! Early on the morning of the 23rd of March, a Marine Studios' truck containing a double-sectioned cage arrived on the Miami waterfront. The charter captains were greatly distraught as they watched the keepers place the cage on the low float of the dock master's office, for in one section, barking irresistibly, was Butch's mate, Fanny. Butch stuck his head out from under Pier 5. Swimming over to the float he thrust his head through the door of the unoccupied cage. He was about to enter when the frantic charter boat captains appeared in the sterns of their boats with arm loads of fish shouting: "Butch! Don't go in there !". They shortly surrounded him with a ring of floating fish. Butch hesitated for a moment and then, casting an almost guilty glance at Fanny, plunged back in the water. The Marine Studios keepers realized now that they were undone, for they were well aware of Butch's enormous appetite. Gobbling fish as long as was able to swallow, he heavily made his way under the Waterfront restaurant Pier and went to sleep. Nothing would bring him out again. Not even Fanny. "It looks hopeless today," admitted his keepers. " We'll try again tomorrow." But hostilities could not be renewed until Butch recovered his appetite. 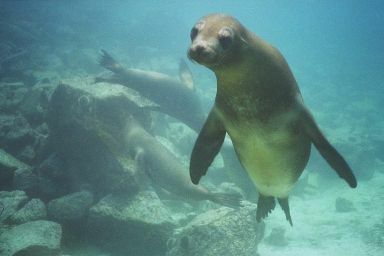 The weary keepers of the Marine Studios, whose sea lion he was , at last succeeded in recapturing him with Fanny's help. But the management and biological staff had enough. Both animals were shortly sold. Porpoises, sharks, rays-yes. Sea lions? No.